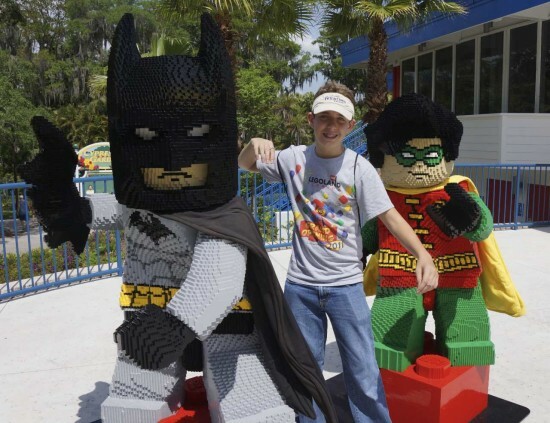 Legoland Florida is offering a chance to play like your favorite superhero during Lego Club Weekend Jun. 16 and 17, 2012. Celebrate with dad this Father’s Day during this special weekend and let him show off the superhero you already know he is. Come dressed in your favorite superhero costume to have a chance to win cool prizes such as a Lego prize pack filled with super hero products, Legoland Florida tickets and the ultimate grand prize of an Xbox 360 Console. Be among the first to preview the all-new Lego Batman 2: DC Super Heroes video game at the Warner Bros. Games Zone. Compliments of Warner Bros. Interactive Entertainment, the first 200 guests to come and play will get a free Lego Batman 2 poster. Become an official certified superhero by defeating the villains at Super Hero Training Camp. The Gardens have been transformed into the ultimate training facility so you can practice your super powers. Challenge your family to a Super Hero Scavenger Hunt. Your favorite heroes and villains have invaded Miniland USA and it’s up to you to save it. The winner will take home a Lego prize pack filled with Super Hero product and Legoland Florida tickets. Meet Max, the Lego Club mascot, and get your picture with him. Enjoy special discounts on food and beverage. All events are included with park admission and subject to change without notice. Click here for more information or to purchase tickets. All attendees can register to become a Lego Club member for free.